It is well known that baseball fans suffer from overbearing nostalgia, a condition that grows more aggressive with age, which is to say as the world deteriorates from that state of sun-dappled perfection that marked our youth. Gone, we lament, are the days when World Series games were played on crisp fall afternoons, not in the middle of an arctic night; when going to Fenway Park was no big deal, and was affordable and wasn't a total-immersion shopping and dining experience; when the initials MLB meant nothing; and when the big secret was only that there were players who were drunks and fornicators, not steroidal humanoids. Surely, it was a better world, innocent of Joe Buck, erectile dysfunction, and the attention-deficient, whomping, zizzing video production that is baseball on national TV. There is no going back, of course, except through books, and increasingly they bring us back very far indeed. The early years of baseball have become the subject of enormous research in recent years, and one of the great heroes of this branch of learning is Peter Morris, author of last year's terrific "Level Playing Fields" and the magisterial "A Game of Inches" (2006), a two-volume encyclopedia of baseball origins, history, and lore. Now he brings us "But Didn't We Have Fun? : An Informal History of Baseball's Pioneer Era, 1843-1870" (Ivan R. Dee, $27.50). Morris has cleared away the sepia solemnity infusing baseball's formal origins, which were incarnate in the Brooklyn Knickerbockers ("generally depicted as such stodgy figures that it becomes impossible to think of them as young men who had fun playing the game"). The essential point that the game was played for fun is present throughout this book, which distills unimaginable research into a brisk summary of baseball's development in its various aspects, all of which have been welters of myth, rationalization, and controversy. Morris moves from the bat-and-ball games that coalesced into baseball, to the triumph of the New York game - a result of its formalized, well-dispersed rules and its suitability for urban spaces - to considerations of equipment and playing fields. Throughout he is generous with curious details, sprightly quotations, and amusing anecdotes. Here is where you will learn of balls made with a sturgeon's eye at their core and of bats "five feet long and nearly as thick as wagon tongues." Beyond this, Morris goes on to trace the evolution of the game from an assertively amateur, recreational pastime to a professional, ruthlessly competitive enterprise, depositing us at the cusp of the modern age with the Cincinnati Red Stockings. Concise, clear, and colorful, this book is a delight to mind and spirit. In "The Dark Side of the Diamond: Gambling, Violence, Drugs and Alcoholism in the National Pastime" (Rounder, $24.95), Roger I. Abrams shows us what bad boys ballplayers have always been and, while he's at it, dishes up potted histories of gambling and alcohol in the United States. For all his gusto in trotting out player misdeeds, his object, as he would have it, is to convince his readers that baseball merely reflects the vices and virtues of the larger society and that, as he puts it, the game "does not need to be cured." As for what he calls "the public contretemps about the comparatively minor use of steroids," he has the effrontery to maintain that "the new testing plan drove steroids from the game. The only cost was to the privacy rights of the ballplayers." Former commissioner of baseball Fay Vincent presents a second compilation of player reminiscences in "We Would Have Played for Nothing: Baseball Stars of the 1950s and 1960s Talk About the Game They Loved" (Simon & Schuster, $25). Among the 11 players here are Ralph Branca, who served up the "shot heard round the world" to Bobby Thomson, the splendor of which has been badly tarnished by the revelation that the New York Giants had added a telescope and buzzer to the five tools of the game. Branca found out about the skulduggery two years later but kept it to himself, though he is still bothered by it. That famous, now infamous, home run gets a going-over by Duke Snider and Carl Erskine as well. For his part, Brooks Robinson looks back fondly at the Oriole players' postgame kangaroo courts for which Frank Robinson, sporting a mop on his head, served as judge. And, indeed, Frank Robinson is also among the interviewed. Today's players are "zombies," he says, their actions directed by a superabundance of coaches, including a bench coach, "a guy that comes out and makes sure the bench is there, right?" 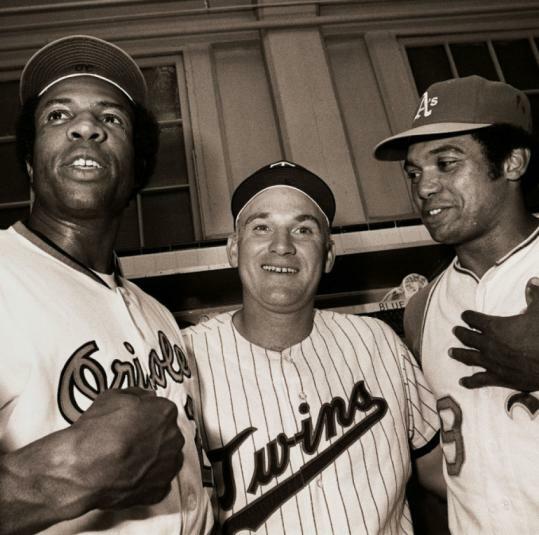 Other players interviewed are Bill Rigney, Robin Roberts, Whitey Ford, and the late Lew Burdette, Harmon Killebrew, and Billy Williams. Though most of these veterans believe baseball has gone downhill for both players (lack of fellowship) and fans (weekend night games! ), the prevailing temper of the book is that of the ceremonial after-dinner speech. To the subtitle of Daniel Levitt's "Ed Barrow: The Bulldog Who Built the Yankees' First Dynasty" (University of Nebraska, $29.95) should be added "After Leaving the Red Sox." Never a player, Barrow spent 50 years in organized baseball as manager, executive, and owner. He was a hard-driving businessman, deeply involved in the money, power, and wheeler-dealer aspects of the game, and his story, well told here, is a remarkable and intricate business history as much as anything else. Barrow's Yankee years (from the 1921 season to his virtual retirement in 1945) produced 14 pennants and 10 World Series championships. But perhaps as interesting to us around here are Barrow's three years (1918-1920) as Red Sox manager, during which the team not only won its last World Series before the notorious 86-year hiatus, but also sold Babe Ruth. Levitt revisits the vexed matter of Sox owner Harry Frazee's motives in selling baseball's greatest player to New York and, in doing so, debunks the previous debunking of Glenn Stout and Richard A. Johnson in 2000, in "Red Sox Century." In that book the two maintained that, contrary to the received opinion that Frazee needed money to support his theatrical ventures in New York, he was, in fact, flush. Frazee, they claim, got rid of Ruth because of his disruptive behavior and increasing corpulence, and because sending him to New York bolstered the alliance between the Sox and the Yankees against their arch-enemy, American League president Ban Johnson. Levitt disagrees with all this in great detail, drawing on numerous sources including archived financial records and other papers. He shows a Frazee in serious money trouble, with Fenway Park mortgaged, interest payments mounting, payment of principal due, and a scheme for buying a New York theater in the hopper. Levitt produces plenty of evidence for an insalubriously cozy relationship between the New Yorker Frazee and the Yankees, and lays out the many deals in which Frazee sold off not only Babe Ruth, but the cream of the Red Sox. (By 1923, eight out of the 13 Yankee regular players were former Red Sox.) Eight years ago Stout and Johnson convinced me of their views; today I am just as convinced by Levitt - though waiting for next year and further installments. Katherine A. Powers's column appears on alternate Sundays. Her essay "My Glove" appears in "Anatomy of Baseball," edited by Lee Gutkind and Andrew Blauner, to be published April 30. She can be reached at pow3@verizon.net.